July 30, 2009  Members of an Iranian opposition group have been complaining of a deadly crackdown by Iraqi authorities. The People's Mujahideen, known by its initials MEK, has lived in a cloistered camp inside Iraq for decades and been under U.S. military protection until the beginning of this year. This week, some members of the group were killed when Iraqi police tried to enter the camp. July 30, 2009  A month ago, U.S. troops officially withdrew from Iraqi cities under a security pact between the two countries. NPR's Quil Lawrence offers insight into how the urban withdrawal has affected everyday life. July 29, 2009  Defense Secretary Robert Gates says there's "at least some chance of a modest acceleration" of the U.S. drawdown this year because of decreased violence in Iraq. He says it's possible that one of 14 combat units could come home early, meaning a cut of roughly 5,000 troops. July 29, 2009  Defense Secretary Robert Gates is returning from a three day trip to the Mideast. In Iraq, he expressed satisfaction with the way Iraqi troops are taking over security responsibilities from U.S. forces. But U.S. commanders in Iraq remain concerned about Kurd-Arab tension in the northern part of the country. They worry that insurgent groups might try to exacerbate and exploit the tension. 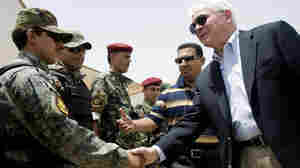 July 28, 2009  Defense Secretary Robert Gates, who is on a short swing through the Middle East, was in Iraq on Tuesday. On his agenda: a visit to a command post in southern Iraq where U.S. troops serve in an advisory capacity; a meeting with Prime Minister Nouri al-Maliki and a visit to Kurdistan. July 27, 2009  One of the most useful security tools is also one of the most difficult for Iraqis to accept because of a cultural taboo. Sniffer dogs are universally recognized as the most effective means of detecting explosives, but Iraqis consider dogs unclean. July 25, 2009  Wesley Gray left a prestigious business school for the U.S. Marine Corps — and then really learned something. He advised Iraqi troops who were preparing to take over responsibility for the security of their country. Host Scott Simon speaks with Gray about his book, Embedded, which recalls his eight months spent advising the Iraqi army as part of a military transition team. July 24, 2009  As Iraq becomes more stable, the country is drawing interest from international investors. Linda Wertheimer talks with Dr. Sami al-Araji, chairman of the Iraq National Investment Council. July 23, 2009  The autonomous Iraqi region of Kurdistan is experiencing something it's unaccustomed to: an election in which no one knows the results in advance. The election will have consequences for the tense standoff between Arabs and Kurds in Iraq — friction that threatens to derail the Obama administration's plan for an orderly withdrawal. Can Iraqis Handle Their Own Security? July 22, 2009  The meeting between Iraqi Prime Minister Nouri al-Maliki and President Obama is the first in Washington between the two men after U.S. combat forces withdrew from Iraqi cities last month. Retired Lt. Col. John Nagl, president of the Center for a New American Security, says the Iraqis have improved dramatically but they still need U.S. help to deter conventional attacks from their neighbors. July 21, 2009  Iraqi Prime Minister Nouri al-Maliki makes his first visit to the Obama White House on Wednesday. With the election season under way in Iraq, Maliki will be keeping an eye on domestic politics there while he's in the United States. He risks losing votes if he's seen as too pro-American, but he's counting on U.S. support at the United Nations.